Malcolm "Sparky" Wade was known as the Little Giant from Jena, his hometown northeast of Alexandria LA. Only 5'6", Sparky played at LSU from 1931-35. He was LSU's greatest basketball star before Bob Pettit in the early '50s. He was a bantam-sized preview of Pete Maravich. He could dribble you into a tangle-foot stance and then leave you flat-footed as he soared toward the basket. With the confidence of a bear and the eye of an eagle, Wade could shoot, pass, and literally do anything with a basketball, including dance on it. Wade seems to have earned his nickname in high school. Principal Eli Plummer affixed the label on him either for Wade's ability to "spark" the girls or the fact that he went up and down a basketball court so fast that sparks flew. At any rate it stuck, and he took it to his grave. The boy's life had been complicated at age seven when his father was shot and killed during an argument with his son-in-law. Malcolm fell in love with basketball at an early age. As he recalled late in his life, "I liked to have run my poor ol' mama crazy with a basketball. I even dribbled it to the supper table; I dribbled it walking to school. Why, I even slept with that dern ball. I'd wear the stitches off a ball, and Mr. Plummer would give me another one." Sometimes he even built fires so that he could continue shooting after dark since Jena High School had no gymnasium. Wade was also an early proponent - if not the inventor - of psychological warfare and "trash talking." If the opposing G was giving him a particularly hard time, Sparky would look the opponent in the eye while dribbling toward him. In a low voice audible only to his opponent, he would start making very disparaging remarks about the player's heritage, particularly his mother. The infuriated rival would take a swing at his tormentor, causing the referees to throw the player out of the game. His junior year, Sparky led the Jena Giants to the state championship in an era when schools were not divided into classes by size. The team then participated in the annual national tournament in Chicago where they defeated a team from Kentucky before losing to a much taller Colorado quintet. For his senior year, Sparky and his mates had a new coach, Bud Gaharan, fresh from LSU, where he learned the man-to-man D he now taught to the Giants. Jena defended their state championship, with all five starters making the All-Tournament team, which also served as the All-State team. As a result, Wade & Company returned to Chicago for the national tournament. This time, they breezed through their first three games before losing in the finals to Athens TX. Sparky was a unanimous choice for the All-Tournament team, which also granted him All-American status. No doubt influenced by his high school coach, Sparky decided to accept LSU's scholarship offer. His time in Baton Rouge would not start well. Malcolm "Sparky" Wade was LSU's greatest hardwood star until Bob Pettit in the early 1950s. However, his time at the Old War Skule started inauspiciously. Sparky got off the bus in Baton Rouge in September 1931 with a dollar in his pocket and some sandwiches his mother had made for him. 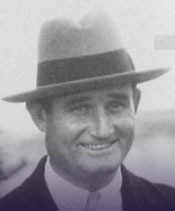 He clashed with Coach Harry Rabenhorst right away - subject of the dispute unknown. So he packed his grip and boarded a bus for Dallas to enroll at SMU, which had also offered him a scholarship. He started practice with the Mustangs, who were thrilled to have the nationally-known star. 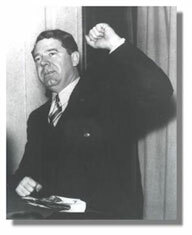 Meanwhile, back in the Louisiana capital, Governor Huey Long called Rabenhorst to see how the basketball team was progressing with their new recruit. Needless to say, Kingfish was upset when he learned that Sparky had left. Always one to tackle a problem head-on, Huey called the athletic dorm at SMU. A teammate told Wade that he was wanted on the phone. When Sparky asked who it was, the teammate replied, "He says he's the Governor of the State of Louisiana." With some trepidation, Sparky took the receiver and said, "Yes, Governor." The agitated voice on the other end let loose a string of explectives as he told the Louisiana exile that he had 36 hours to get back to LSU! If Wade did not return, Long would send a bulldozer to Jena and cut the road in two so that Mrs. Wade would have to swim to get out of town. Not daring to call the governor's bluff, Wade did as he was told. The rest, as they say, is history. In a precursor of what happened in 1966-7 when Pete Maravich was a freshman, fans enjoyed watching the 1931-2 LSU "Kittens" that included Wade, Jack "Bucky" Harris, Nathan "Buddy" Blair, Ben Journeay, and Roland Brown. These players would form the nucleus of LSU's 1935 National Champions. The next season, LSU joined the new Southeastern Conference. With Wade and three of his fellow sophomores starting, Harry Rabenhorst's Tigers went 15-8. Wade led the conference in scoring with 193 points and made the All-SEC Tournament team after LSU beat Auburn and Tennessee in Atlanta before losing to Kentucky in the semifinals in the Tigers' first-ever meeting with the Wildcats. Sparky had already gained a reputation as a showman on the court, another trait he shared with Pistol Pete. "Sparky" Wade, Jena's contribution to Southeastern Conference basketball, knows more tricks than Huey Long, another Louisiana celebrity. ... Wade, the conference's leading scorer, is the Thespian of the hardwood floors, famililar with the 12 classical attitudes and is a born entertainer. He is at his best before a large and responsive audience. He is the best shot in the conference ... He introduced legerdemain to basketball. The L.S.U. sophomore is ambidextrous - really. He can put both hands behind him, holding a baseball, and throw with either hand - letting you try to guess which. He throws equally well with either hand, baseball or basketball, which is admittedly an advantage. He had the gallery in stitches the first time the [Jena] team went to Chicago, because he demonstrated great prowess in stealing the ball from opposing players time after time. The amazing thing about Wade is that he was not considered a very good shot until his senior year. Prior to that he was a classic team player with his dribbling and passing off to teammates, so they could shoot. In his senior season, Malcolm "Sparky" Wade took LSU to heights never seen or even imagined in Louisiana. LSU finished its season 14-1. The only loss was to Rice in Houston, 56-47. Wade later said, "The Rice Gym was an old auditorium with one chandelier with twenty-five watt bulbs. You could not see your feet or the color of uniforms. Even the floor was unwaxed." The Rice game was one of only three games away from Baton Rouge and the only one not in Louisiana, since the other two away games were at Tulane in a two-night series in February – a common scheduling ploy in those days. LSU hosted two-nights-in-a-row games against Alabama, Ole Miss, Mississippi State, Vanderbilt, and Tulane. Notice the major missing conference opponent: the Kentucky Wildcats. Adolph Rupp's squad was 11-0 in SEC play. LSU claimed the crown with a 12-0 record since the post-season conference tournament was not held that year. In its media guide, Kentucky claims to be the 1935 SEC "Co-Champions." LSU's publication says simply "SEC Champions." Scores against common opponents favor Kentucky. In 1935, there was no NCAA tournament (first one 1939) or NIT tournament (1938). There wasn't even an AP poll (1948-9). However, LSU got an opportunity to claim a "national championship" when it was invited to play in the "American Legion Bowl" in Atlantic City, NJ, against the Pittsburgh Panthers. LSU met Pittsburgh on April 13, 1935, before 5,000 fans in the Atlantic City Auditorium. Doc Carlson's 18-5 Panthers did a good job of curtailing Wade's scoring, holding him to five points. They jumped out 18-4 and led 26-17 at the half. Pittsburgh used a figure-eight offense," said Buddy Blair (top row, far right in picture above). "We had not seen this before, and it hindered us in the first half. In the second half, we got our fast break going and just about ran them crazy." The Tigers roared back to win, 41-37. Blair led all scorers with 20 points. To this day, LSU proclaims this team as "1935 Mythical National Champions." Sparky's contemporaries raved about him. Dennis F. "Pete" Burge, a teammate: "He was a natural-born showman, and in addition to having split vision and exceptional ability, he was particularly known for his dribbling. Because of his size, he delighted in making monkeys out of his opponents - the bigger and taller, the better! Sparky spent hours in the off-season ... working on his ball-handling techniques. He came by his trick dribbling and his ability to be a showman by much diligent hard work." Coach Harry Rabenhorst, who enjoyed a 42-13 record during Sparky's three varsity seasons: "The greatest little man basketball has ever seen. Once when I was scouting the National Tournament in Chicago, Jena wanted to freeze the ball. Sparky dribbled by himself for a minute and 45 seconds, and no one could touch the ball or tie him up. That was before the center line, and Sparky went up and down the whole court dribbing the ball. Sure, he was cocky, but then he could do anything he said he could. For a little man, he was the greatest!" When he was inducted into the Louisiana Sports Hall of Fame, Wade said the following in his acceptance speech. I'm not as great as they say I am. I have to stretch to be 5'8" tall. I was just a little country boy from Jena when I came to LSU, and anything I've accomplished, I owe to the fine people of Louisiana who encouraged me and have never forgotten me. But you know basketball is the silliest game in the world. You have 10 guys and only one basketball, and if I have the ball, who can beat me? Sparky died on his 73rd birthday in 1983. With Shaquille O'Neal just retired from the NBA as this is written, we look back at his career at LSU. Let's start at the beginning - Coach Dale Brown's first meeting with Shaq. Dale was at a military base in West Germany teaching a clinic for the U.S. Army. He spoke to the officers on leadership and enlisted men on teamwork. He also did one basketball skills clinic. Right after his lecture, a young man about 6'7" came to him. He asked Brown to recommend some exercises for his legs because, as big as he was, he could not dunk. After Dale demonstrated some exercises, he asked the young man how long he had been in the service. "Coach, I'm only thirteen years old," he replied. 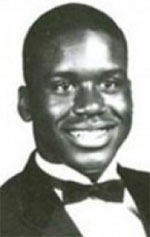 Of course, it was Shaquille O'Neal, whose stepfather was an Army sergeant. As Brown recounts, "I'm no dummy. 'Is your father around?' I asked." Shaquille took Brown to his father. Brown introduced himself as the head coach at LSU and told Philip Harrison that he thought his son could develop into a player. "I want to keep in touch." Harrison wasn't impressed. He told Brown he was more interested in his son's academic development than his basketball abilities. "If you are interested in my son's educational and intellectual capabilities, we might talk someday," he told Dale. Brown assured him that he agreed with that philosophy 100%. Dale did indeed keep in touch. Shaquille suffered the same setback that Michael Jordan had undergone several years earlier - he was cut from his school team in his sophomore year. Brown didn't see O'Neal play until Sergeant Harrison had been transferred to San Antonio. Dale went to Texas to watch a summer league game. LSU was the only major school represented in the stands. "It was obvious that Shaquille was raw. He could run and could block shots, but the game was not yet part of him. But you could also tell he had a great attitude." Dale was also ipressed by the demeanor of both the father and the mother. As a senior, Shaq led Cole High School to the state championship. "He had really developed into a player and everyone around the country started showing up to recruit him. Fortunately, Shaquille didn't forget that we had been there fro the beginning. He came for a campus visit and was a perfect gentleman." Dale: "It was probably the most clean and honorable, simplistic recruiting effort I have ever dealt with. Everyone was above-board, everything was strict and everything was disciplined. There was no attempt to drag it out and get more publicity. Shaquille signed early. I really thought this family should be the beacon light for everyone with a son being recruited ... In all of my recruiting of high profile players, never have I ever met a family that was less complicated, or more determined to do things exactly by the rules." Brown repeated that sentiment at Shaq's press conference announcing his retirement from the NBA. Still, O'Neal's career in TigerTown was not all smooth sailing. Coach Dale Brown "became fond" of Philip and Lucille Harrison, Shaq's parents. Philip would call Dale for advice. Whenever the LSU cheerleaders would go to San Antonio for a contest, the Harrisons would host them for a barbecue. When Dale traveled to the Alamo City, Philip picked him up at the airport. "He always greeted me with great big bear hugs." Still, as Shaq's career took off, Philip "became more involved, more opinionated and more critical." The parental meddling "began to disrupt our efforts to teach him some different scoring moves. [Shaq] was not one hundred percent interested in shooting the hook or the turnaround jumper. He knew he was so big and powerful that he could dunk almost all the time." Dale tried to convince the big guy that he would get double- and tripled-teamed in the SEC and needed to diversify his game. To that end, the coach "arrnaged for two of the greatest players to ever play the game, Bill Walton and Kareem Abdul Jabbar, to come in and tutor him. (The NCAA, in its great wisdom, has now eliminated this teaching tool.)" Bill worked with Shaq on his post-up moves and passing. Kareem tried to teach O'Neal his famous hook shot. "Even with both of those all-stars teaching Shaquille, I noticed that he was barely interested." Shortly afterwards, Mr. Harrison called Dale. "Coach, why did you bring in Jabbar and Walton to work with Shaquille?" Dale explained the obvious, that these were two of the greatest centers to ever play the game. "I want to make sure, as we work to develop Shaquille, that I don't leave any stone unturned." Then Philip made a surprising comment. "Coach, I would prefer Shaquille use his power and dunk everything he can." Taken aback, Dale replied, "Philip, you said I was to be Shaquille's father away from home as well as his coach. You've given me that leeway, and I think that has worked well for Shaquille's best. Let's leave it that way." As Dale concludes, "He got the message and never questioned me again." 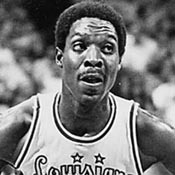 O'Neal joined the LSU team for the 1989-90 season. Brown had put together back-to-back Top Ten recruiting classes, headed by Chris Jackson in '88-89 and Shaq and another 7-footer, Stanley Roberts, the next year. As a result, LSU fans' expectations as O'Neal's freshman season began were over the top, exacerbated by the Tigers' #2 in the preseason AP poll. Talented but inexperienced, LSU couldn't live up to the hype. Still, the season was by no means a failure. The Tigers finished 23-9, 12-6 in the SEC. They defeated Villanova 70-63 in the first round of the NCAA tournament before bowing to Georgia Tech, 94-91. Tech would make it to the Final Four. Shaq made the AP, UPI, and Coaches All-SEC team. 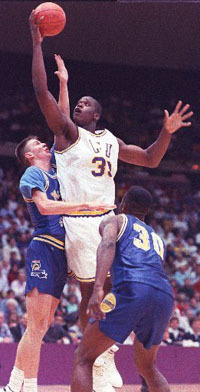 LSU suffered several setbacks prior to Shaq's sophomore season (1990-1). Chris Jackson elected to enter the NBA draft. Stanley Roberts and Maurice Williamson fell victim to academic problems. That left only one real star on the team - Shaquille O'Neal, who dominated the U.S. Olympic Festival that summer. Coach Dale Brown crafted an ambitious schedule predicated on having his full arsenal of players. Early in the season, LSU hosted #2 Arizona, which boasted a trio of big men in the person of Bryan Williams, Ed Stokes, and Sean Rooks. If nothing else, Coach Lute Olsen would use his bigs to foul out Shaquille in the first ever hardwood meeting between the two schools. No such luck. O'Neal scored 29 (a career high at the time), collected 14 rebounds, blocked 6 shots, and even made 5 steals in the 92-82 victory. Shaq played the last minutes with four fouls. As Olsen commented after the game, any official who fouled out Shaq wouldn't have escaped the Maravich Center alive. Laker great Kareem Abdul-Jabbar, in town to tutor Shaq on pivot play, watched in admiration. More big victories followed in the 20-10 season. For the second year in a row, the run-and-gun Lions of Loyola-Marymount came to Baton Rouge and left with a defeat. This one was 122-114, a slow pace after 148-141 in OT the year before. On February 5, the Tigers hosted #10 Kentucky and prevailed 107-88. Unfortunately, Shaq suffered a stress fracture in his leg in the second-to-last regular season game at Florida. The 79-66 victory clinched a co-championship for the Tigers. Without Shaq, LSU lost the finale at Mississippi State that allowed the Bulldogs to tie for the regular season crown. Shaq also missed the opening SEC Tournament game, a 92-77 loss to Auburn. He returned for the NCAA Tournament game against Connecticut at Minneapolis. He was far from full strength in the 79-62 defeat. 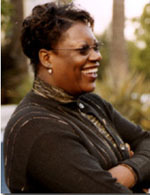 O'Neal earned College Player of the Year from every wire service and publication. LSU got a bonus when Shaq returned for his junior year. With even less talent surrounding Shaq than in 1990-1, Brown, who, like Les Miles, could never please a certain percentage of the fans (if he won, it was because of superior talent; if he lost, it was because he couldn't coach - sound familiar? ), coaxed a 21-10 record, including 12-4 in the SEC. LSU lost a crucial game at Arkansas in the second-to-last regular season contest. With the score tied and seconds to play, LSU inbounded under the opponent's basket. As Nolan Richardson admitted later, the Razorbacks intentionally fouled O'Neal, a poor FT shooting, knocking him to the floor. Yet veteran official John Clougherty choked on his whistle. I remember not even watching the OT, knowing LSU had no chance. The 106-92 loss kept the Tigers from the championship. The first game of the SEC tournament produced a brawl that led to Shaq's suspension from the second game against Kentucky. Once again, he was SEC Player of the Year and All-American. The NCAA committee rigged the pairings to set up a second round matchup between LSU and Indiana after the Tigers beat BYU in a game in which Shaq set a tournament record with 11 blocks. The Tigers started fast against the Hoosiers, but Bobby Knight's crew won 89-79 in Shaq's last game in Tigertown. Orlando selected O'Neal with the #1 pick in the 1992 NBA draft. Three years later, the Magic made the finals. Following his retirement from the NBA after the 2010-11 season, LSU announced that a statue of O'Neal would be erected at the entrance to the new basketball practice facility. He is the first LSU athlete in any sport to have a statue on campus, a fact that upset supporters of Pete Maravich. As happened every year when the Tigers played in the Parker Agricultural Coliseum, they finished the season on the road in 1969, playing their last five away from Baton Rouge. 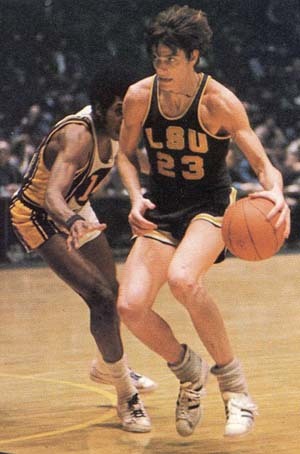 Junior All-American Pete Maravich went into the final game at Georgia with an opportunity to break his own single season scoring record set the year before when he averaged 43.8 ppg. Pistol Pete needed to can 49 points in the finale to eclipse his own record. The SEC didn't play a post-season tournament during his time at LSU, and the Tigers needed to win the final game to finish 13-13, hardly a record that would gain the attention of the NCAA or NIT selection committees. Pete had the nation's scoring title locked up as he was 10 ppg ahead of his nearest pursuers, Rick Mount of Purdue and Calvin Murphy of Niagara. A crowd estimated at 13,000 overflowed the arena that sat 10,500. Pete was aided in his quest for a new record by a scintillating double OT shootout in Athens. Leading the Tigers back from a 15-point deficit, he scored 24 of LSU's last 29 points, including 13 straight in a surge that sent the Tigers into the lead, 72-70, after they trailed 59-44. Georgia's Jerry Epling hit a jump shot at the buzzer to send the game into OT. Les Robinson, a coaching friend of Press Maravich who attended the game, said, "The crowd starts cheering [when the game went into OT]. They don't care who wins. They came to see a show." As the clock wound down in the second OT, Georgia held a 2-point lead. As Epling tried to run out the clock, Robinson heard something he has never heard before or since. The crowd started booing the home team. Discombobulated, Jerry took a shot that LSU rebounded. That allowed Pete to flip in a basket with six seconds left to deadlock the game again at 78, sending it to a second OT period. The Pistol sank eight straight points to give LSU a safe 87-80 lead, with the Bulldogs scoring only two FTs in the second OT. 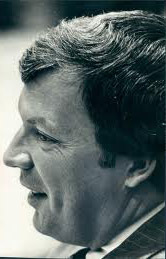 As time wound down with no shot clock, Pete went into his Marques Haynes Globetrotter act, dribbling through the entire Georgia team. "The fans were going nuts. You could not hear anything," said Bulldog G Herb White, who had fouled out trying to guard Pete. As the last seconds elapsed, Maravich dribbled toward the LSU bench and, without breaking stride, threw up a 30-foot hook shot for his 57th and 58th points. "The ball hit the bottom of the net without touching the rim," said the writer in the State-Times. LSU won 90-80 as Pete wiped out his previous record. The fans came out of the stands and carried him off the floor. Pistol told Robinson, "I think it's the greatest game I've ever played." Maravich finished the season with 1,148 points for a 44.18 average. His 2,286 points for two seasons set another all-time record (that still stands like the points-per-game record and will probably never be broken). On Friday night, February 19, 1937, LSU won at Tulane 37-31. It was the Tigers' 18th straight victory over the Green Wave. 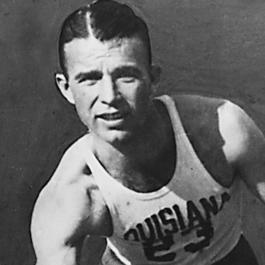 To quote The New Orleans Item, "the Bengals practically assured themselves of a place in the Southeastern conference tournament ..."
Arnold "Buster" Bryan (also called "Judge") led the Tigers with 13 to pad his scoring leadership in the conference for the second straight season. The senior had made second team all-SEC in 1936. Tulane hurt its chances by missing 11 of 18 FT attempts. Some rules were different than they are today. 1936-7 was the last year of the center jump after every made basket. The team with the taller C could control the ball for most of the game. Four fouls eliminated a player from the game. A FT was taken after every foul. If the player was not in the act of shooting, he shot just one regardless of the number of fouls of the opponent in the half or game. Just one official, Riner, was listed in the box score. Even high school games at that time used two refs. Harry Rabenhorst's Tigers got off to a good start. It took the Green Wave eight minutes to score their first point. "Tulane had trouble with its pass work and plays under the basket." TU was hampered by the loss of Dietrich Neyland in the middle of the first half via the four-foul rule. LSU led at the half, 18-12. The Wave fought back after intermission. The Greenies tied the game at 21. Junior Ray Giacoma broke the deadlock with a basket, and Tulane never caught them after that. The Tigers lost starter Bill Leathers, another senior from the 1934-5 national championship team. He re-injured a bad knee. Perhaps it was the loss of Leathers or just the Law of Averages catching up to them, but the Tigers were thumped 52-32. LSU still qualified for the SEC Tournament in Knoxville but lost to perennial power Kentucky 57-37 to end the season with a 13-7 record. The 1980-1 Tiger basketeers traveled to Lexington KY to finish their SEC schedule. The past few years the matchup between the Tigers and Wildcats had championship implications. The previous season, Kentucky lost to LSU in Lexington but beat the Tigers 76-74 in OT to win the regular season crown. In 1981, the Tigers had already taken care of business. They were 17-0 in conference play with a three-game lead on the Wildcats. The 27-1 Tigers were ranked #2 in the nation while KU sat at #9. LSU had thumped Kentucky 81-67 in Baton Rouge on January 19. The Bengals had won an incredible 26 games in a row, the nation's longest winning streak, following an early loss to Arkansas in the Great Alaskan Shootout. The Wildcats took the court in their own arena as an underdog for one of the few times since Adolph Rupp made KU a national power. Dale Brown had built what many would argue was his finest team ever. The most heralded player on the '80-1 team was 6' 7" senior F Durand "Rudy" Macklin from Louisville. Rudy finished his four years in Baton Rouge with a bang, being voted SEC Player of the Year and first team All-American. The other F was Leonard Mitchell, a freshman from St. Martinville. Leonard played taller than his listed height of 6' 7" because he could jump so high so quickly. He would earn four letters. In the pivot was the "Cookie Man," 6' 10" senior Greg Cook. Glowering during games like he was mad at the world, Cook added another ferocious rebounder to the front line. The shooting G was 6' 5" freshman Howard Carter from Redemptorist High in Baton Rouge, averaging 16.2 per game to earn second team All-SEC honors. Running the club was senior Ethan Martin, whom coach Dale Brown called "as good a point guard that's ever played in this league." Like Macklin a first-team All-SEC selection by the AP, UPI, and Coaches, Ethan led the team in assists (5.2 per game) for the fourth straight year. Off the bench came one of the best sixth men in the nation in southpaw G Willie Sims. Determined to prevent LSU from finishing the SEC campaign undefeated - something only Adolph Rupp's Wildcats had ever done, coach Joe B. Hall's quintet started strong on Senior Day. The Cats jumped out 10-3 and led by as many as 10 points in the first half before LSU closed the gap to 36-30 at intermission. The Tigers pulled within two points several times in the second half behind 15 points from Mitchell and 14 from Macklin, always keyed up playing in his native state. The game came down to the last seconds. After nearly losing the ball three times in the final minute, LSU took the ball out of bounds under the Kentucky basket with 10 seconds remaining trailing 73-71. Carter, who led all scorers with 24 points, threw the ball to Martin near the midcourt line, then got it back behind Macklin's pick. Instead of shooting immediately, Howard thought he saw an opening and decided to improve his position. He launched a potential game-tying shot, but Sam Bowie stretched his 7' frame and blocked it to preserve the triumph. Rudy recalls, "Carter got knocked down by Sam Bowie and the referee swallowed the whistle." Many in the record crowd of 24,011 in Rupp Arena stormed the court, a rare occurrence in Bluegrass country where the Big Blue usually dominated the SEC and expected to win every game. His players carried Coach Hall off the floor as if they had won the SEC title. "We were embarrassed at LSU," Bowie remarked afterwards. Of the last shot, Sam said, "We knew he was the man for the money. We thought he would shoot from 20 feet." Carter: "I saw the baseline open and I went in. I was hoping to draw the foul or get the basket. He touched me. I didn't fall on the floor myself. But I don't know if it was enough for a foul. If I would have been a spectator, I could tell." The Tigers, a #1 seed, made the Final Four but, with Macklin hampered by a broken finger sustained in the Regional Championship victory over Wichita State in the Superdome, fell to Indiana 67-49. LSU scheduled a regular season game in the Superdome in two consecutive seasons, 1989 and 1990. Both turned out to be scintillating games before large crowds. This article deals with the first of the two, against Georgetown January 28, 1989. John Thompson's 15-1 Hoyas were ranked #2 as they played their first game in the Dome since their one-point loss to North Carolina in the 1982 NCAA championship game. Dale Brown's Tigers sported a 13-5 record, including four in a row as they headed to New Orleans. The Saturday afternoon game attracted 54,321 despite four Mardi Gras parades in the area. The attendance ranked as the largest ever to watch a regular-season college basketball game and second only to the 57,607 at the 1987 Final Four in the Dome. We had been hit hard with injuries and some prop-48 casualties, and the Hoyas were so strong that year that CBS ... had called us and gave us the offer of dropping the game since it was such a mismatch. This only made us more determined to play. The contest promised to be a duel between freshman sensations. Chris Jackson, leading the nation in scoring, had attracted attention with 53 points in his SEC debut at Florida in December. C Alonzo Mourning contributed strong rebounding and shot blocking to the Hoyas. The back and forth game saw LSU leading 44-41 at halftime. Then the Tigers built a 65-55 lead with 9:13 left in the game. Charles Smith and New Orleans native Jared Jackson with 6 each led a 17-6 run to brought the Hoyas to 72-71 with 4:38 left. GU's run was aided by LSU going cold from the FT line. The Tigers missed five in a row, including three front ends of one-and-ones. The teams battled nip-and-tuck the rest of the way as the game was tied eight times with 14 lead changes. Georgetown tied it at 80 when Charles Smith made the second of two FTs with 20 seconds left to set up a wild finish. With the Hoyas pressing, Jackson got the ball into the front court but was swarmed by three defenders. Chris managed to get the ball to Russell Grant, a walkon from Louisville who launched a jump shot just outside the 3 point arc with 6 seconds left. Mourning got a tiny piece of the ball, causing it to land short. Players from both teams fought for the rebound, which LSU C Wayne Sims deflected into the hands of 6' 6" F Ricky Blanton under the goal. He put the ball in the basket with two seconds left to send the throng into delirium. Chris Jackson won the frosh scoring battle. Chris netted 26, far exceeding Mourning's 9. However, Alonzo's 13 rebounds keyed Georgetown's 46-26 edge on the boards. Sims added 24 for the Tigers while Blanton had 14 and Vernel Singleton, 11. Smith led all scorers with 32 while Jared Jackson threw in 28. Brown praised his warriors afterwards. If you took our talent and matched it up against Georgetown's, maybe we shouldn't have even shown up for the game. But I have my own poll. I don't care whether we're ranked by the wire services. I have a poll for desire and a poll for hustle and a poll for love, and we're No. 1 in all of those. Dale said Blanton's basket was typical of his play all year. This guy is a fighter. He just will not quit. Maybe in the NBA drafted on heart, there wouldn't be so many people just standing around in their games. Ricky would be a No. 1 draft choice if they drafted on heart. Thompson said the crowd noise didn't bother his team, which lost a chance to move to #1 following Minnesota's upset of Illinois earlier in the week. To tell the truth, I think the noise has a greater effect in a smaller arena. The 1988-9 Tigers finished the season 20-12, 11-7 in the SEC. They lost to Texas-El Paso in the first round of the NCAA tournament. For the second year in a row, LSU played a game in the Louisiana Superdome in 1990: Notre Dame on January 20. Tigers coach Dale Brown designated all proceeds from the event over the $75,000 guaranteed to each team to go to the homeless. He even cancelled the Wednesday practice before the Saturday game to promote the contest. LSU, which had started the season ranked #2 thanks to what was considered one of the best recruiting classes in the nation, boasted an 11-2 record, the losses coming to Kansas 89-83 in the preseason NIT and at Mississippi State in OT in the first SEC game. This was not one of Digger Phelps' better teams. The Fighting Irish came to the Crescent City 8-5. Dale's efforts paid off as 68,112 tickets were sold to break the previous year's record of 66,144 sold against Georgetown. However, heavy rains that caused minor street flooding in the New Orleans area held down actual attendance to 44,233. Brown's team sent the vast majority of the throng home happy as the #13 Tigers romped 87-64. ND led for only 38 seconds as LaPhonso Ellis's bucket produced an 18-17 advantage midway through the first half. Freshman G Maurice Williamson scored 8 points over the final eight minutes of the first half to spark LSU to a 40-28 lead at the break. Brown afterwards: "We weren't sure if they were going to try and play upbeat, and I think they did a good job in the first half of controlling the tempo and working the clock." Another freshman, C Shaquille O'Neal, netted 6 in the first four minutes of the second half as the Tigers expanded their lead to 48-29. Notre Dame cut the margin to 52-40 on a FT by Ellis with 11:25 left. But the Irish didn't take enough advantage of a three-minute scoring drought by LSU, getting only three points on Ellis's FTs during that time. LSU then went to a new source of clutch shooting. Instead of sophomore G Chris Jackson, the go-to guy for the last year and a half, it was the other 7' freshman C, Stanley Roberts. He responded by being unstoppable during the next three minutes to propel the Tigers to a 71-52 lead. Roberts: "We didn't want to take the outside shot at that time, and with Shaquille out, I had to take care of the inside game by myself. I loved it." The 23-point loss was Notre Dame's worst since an 87-54 defeat at the hands of Virginia in 1982. The victory was LSU's second straight by 20+ points after the 101-72 romp over Vanderbilt. Both teams had balanced scoring. Jackson led the Bengals with 21 while Roberts contributed 18. Shaq ended with 17 and Williamson, 14. Ellis led all Irish scorers with 19. Joe Frederick added 16 and Jamere Jackson 10, all in the final 5:01. Roberts cited two factors that helped his performance. The Irish double-teamed Jackson, and the ACC officials allowed a physical game under the basket. "They let us play," said Stanley. "They let us bang down inside more than we're accustomed to." Phelps admitted there wasn't much his guys could do with LSU's big men. "They dominated us inside with Roberts and O'Neal. They have tremendous balance." ND also had trouble getting the ball inside against LSU's changing defenses. "We wanted to go inside with the ball as much as we could," said Digger, "but LSU intimidates you when you go inside." O'Neal had three blocks and Roberts, two. As a result, ND, which entered the contest leading the nation in FG% (54.1%), endured its worst shooting performance of the season - 39%. LSU shot 58.3% (35-60). Williamson explained: "You can gamble on defense. If you go for the steal and miss, and they penetrate, then they still have to go against those two." Shaq added: "The two of us work well together. If a guy loses me, he has to deal with Stanley. If a guy loses Stanley, he has to deal with me. It makes it easier." The young Tigers ended the season 23-9, 12-6 in the SEC. They defeated Villanova in the first round of the NCAA tournament before bowing to Georgia Tech.